Spooky Empire will bring stars of horror films, TV, music and more to the Wyndham Orlando Resort for their annual mid-season convention the weekend of April 6-8. The 3-day event will feature an array of activities including celebrity autographs with meet & greets, photo ops, Q&A’s led by special guests, live performances, and their popular tattoo festival with more than 25+ artists. 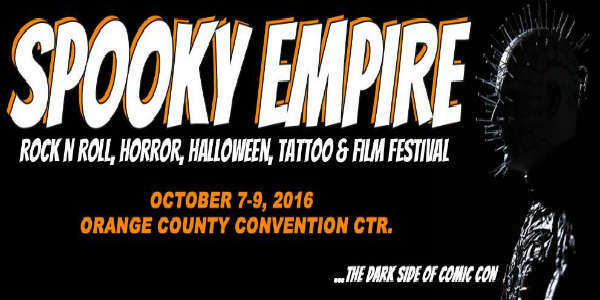 Spooky Empire will amp up the Halloween excitement when it returns to Orlando, bringing in celebrities from the worlds of film, tv, and music the weekend of October 27-29, 2017. Highlights of the weekend festivities will include the reunion of the cast of Sixteen Candles, featuring Molly Ringwald, John & Joan Cusack and Anthony Michael Hall live on stage, along with the cast reunion of The Lost Boys, featuring Billy Wirth, Jamison Newlander and G Tom Mac. Spooky Empire is returning to the Wyndham Orlando Resort for the 2017 edition of their Retro horror con the weekend of April 21-23. Spooky Empire Retro will be headlined by a roster of celebrity guests that includes the legendary actors Malcolm McDowell and Joan Cusack, along with Dee Snider, frontman of Twisted Sister and the creative force behind the cult horror classic, Strangeland. Spooky Empire is kicking off next month by bringing in celebrities from the worlds of horror, music, and wrestling to Orlando the weekend of December 2-4, 2016. The event was originally scheduled to take place in October, but Hurricane Matthew changed that plan. Spooky Empire regrouped, and now are ready to put on an incredible show at the Orange County Convention Center, with many of the same guests who were scheduled for the original event, along with new ones. Last month, we told you about all the great horror stars and other guests that would be at the annual Spooky Empire show in Orlando. Can you believe the line-up has gotten even more amazing? Who should you be getting excited about? How about “Weird Al” Yankovic himself! His comedy concerts sell out, but you can meet him with admission to Spooky Empire. Horror fans mark your calendars! 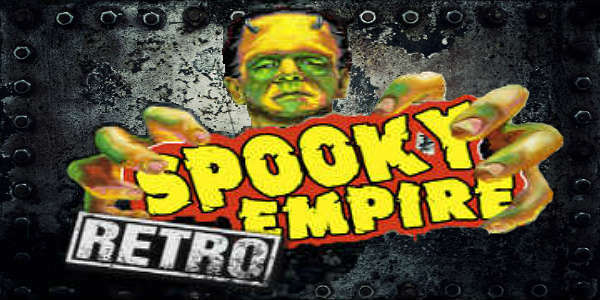 Spooky Empire returns to Orlando October 7-9 and this time they’re taking over the Orange County Convention Center. Designed to be THE ultimate weekend for horror fans of all ages, the event allows guests to meet and mingle with their favorite movie and TV stars, buy amazing collectibles from hundreds of vendors and artists, see new and emerging films as well as old favorites, get tattooed by some of the best artists in the world, and take part in one of the largest Zombie Walks in the country. Spooky Empire’s Ultimate Horror Weekend is one of the largest horror conventions in this country, and it returns to the DoubleTree by Hilton at Universal Studios the weekend of October 24-26. Spooky Empire‘s spring shindig May-Hem returns to Orlando May 30 – June 1, and brings to town a huge roster of horror fim and TV celebrities for fans to meet. From Once Upon a Time, you can meet Lana Parrilla, Rebecca Mader, Sean Maguire, and Lee Arenberg. From the original Halloween, meet John Carpenter, PJ Soles, Nancy Loomis, and more. From the original Nightmare on Elm Street, meet Robert Englund, Heather Langenkamp, and others. Also on the bill are horror icons like Jamie Kennedy (Scream), and Laurie Holden (The Walking Dead). The event is being held at the Universal Double Tree Resort. 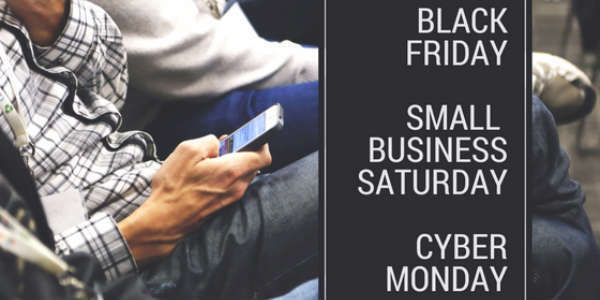 Daily tickets are $30 (Fri and Sun) and $35 (Sat) in advance. Add $5 if you purchase day of at the door. A weekend pass is $50 advance/$60 at the door. There is also a $199 VIP pass. Autographs by the celebrities are additional. 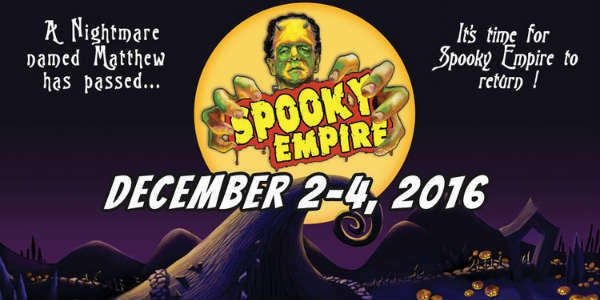 For more information, or to purchase tickets, visit SpookyEmpire.com. Looking for something to do this weekend that combines the best in horror with celebrities from popular movies and TV shows? Then you’ll want to check out the Spooky Empire Ultimate Horror Weekend that runs October 25 – 27.